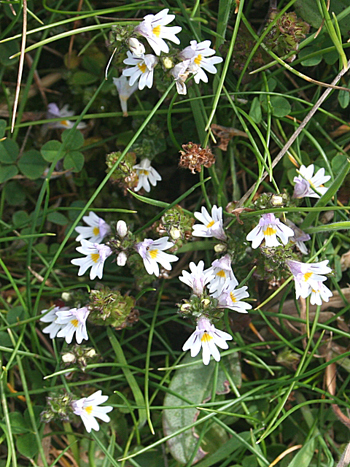 Red eyebright is a small, downy, annual herb 4-8 inches high; its square, leafy stem that is slender, semiparasitic (root is attached to grasses), grows up to 12 inches high and bears opposite, stiff, tiny, bristle-toothed, ovate leaves. The two-lipped, red or purple and white flowers grow in axillary leafy spikes from June to September. Three lower lobes notched, with purple lines. Highly variable. Fruits are capsules, cupped in sepals. Some call Lobelia by the common name of eye bright. Very common in dry, meadows, pastures, and other grassy areas of Europe and western Asia and probably naturalized in various places in the United States. Subarctic south to Quebec, Maine, Massachusetts, New York. Native of Europe. Bitters, inositol, volatile oils, PABA, sulfur, tannins, and vitamins A, B3, B5, B12, C, D, and E.
According to the story of Arnoldus de Villa Nova, “it restoreth sight to them that have been blind a long time before.” Culpeper says it will restore the sight decayed through age. Used as an eyewash or poultice for eye inflammations, blepharitis, eye strain, treating styes. Prevents secretion of fluids and relieves discomfort from eyestrain or minor irritation. Good for all eye disorders. An infusion or poultice has been used for symptoms associated with colds, such as coughs, hoarseness, earaches, headaches, sore throat, nasal congestion, allergy, and catarrh. In Europe it has sometimes been taken for hay fever. Taken internally, it may be helpful in maintaining good vision and eye health. Make preparations fresh each time. Infusion: steep 1 heaping tsp. fresh herb in boiling water for a few minutes. Take 1-2 cups a day. Decoction: Boil 1 tsp. dried herb in 1 cup water for 5 minutes. Tincture: take 15-40 drops every 3-4 hours, as needed. Herbalists often combine eyebright with goldenseal in eye lotions. Vitamins A, B3, B5, B12, C, D, and E.
Extract: mix 15 to 40 drops in liquid every 3 to 4 hours. 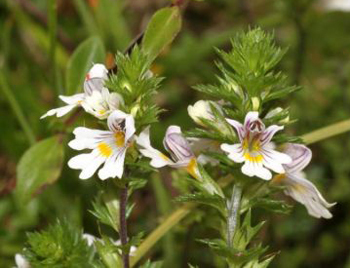 Eyewashes: eyewash products containing euphrasia (eyebright), plus other herbs such as golden seal, bayberry, raspberry leaves, and cayenne pepper, are available commercially. Put the eyewash in an eyecup and rise out the eye 3 to 4 times daily. Experimentally, may induce side effects, including dim vision. Avoid use without a doctor’s supervision. This plant is not considered safe today.